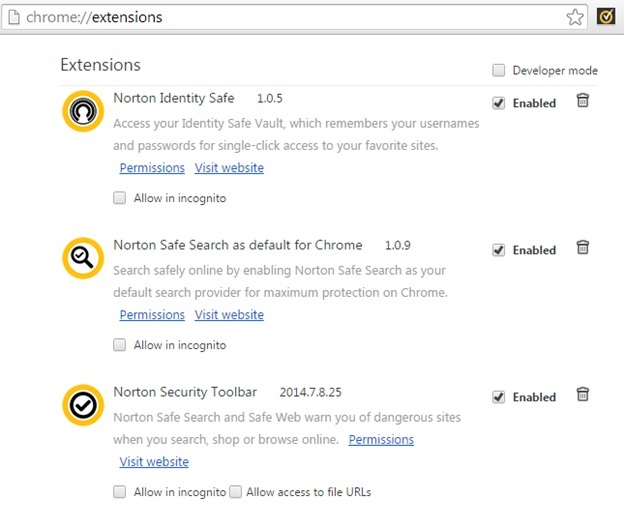 Due to recent changes in the latest Google Chrome web browser, extensions such as the Norton toolbar have had to be redesigned.The latest Norton toolbar extension is compatible with both 32-bit and 64-bit versions of the Chrome browser (Chrome v37.0.2062.124 at the time of this writing). If at any time while performing the troubleshooting steps Chrome asks for permission to install or enable a Norton extension, please agree to do so. Please use the below info to identify your problem symptom and solutions to fix. The various possible causes and solutions make reference to specific Steps that are listed at the bottom of the page. Solution: In chrome go to Chrome://extensions, If the Norton Security Toolbar extension is not present, start with Step 1 and then proceed to the later steps in order. Solution: In chrome go to Chrome://extensions, If the Norton Security Toolbar extension is present but grayed-out, follow Step 4 to enable the extension. Possible Cause #1: Offline/background extensions are running. Solution: Follow the procedure in step 6 to disable offline chrome apps, and the reboot computer. Solution: Reboot the computer after installing the extension to finalize installation. Possible Cause #1: Identity Safe feature is turned off. Solution: Turn on Identity Safe from your Norton product settings, then exit and re-launch the browser. Possible Cause #2: Norton Identity Safe extension is not installed. Solution: In Chrome go to Chrome://entensions. If the Norton Identity Safe extension is missing, then follow Step 5 to install the extension. Possible Cause #3: Norton Identity Safe extension is disabled. Solution: In Chrome go to chrome://extensions. If the Norton Identity Safe extension is present but grayed-out, follow Step 4 to enable the extension. Possible cause #4: Offline/background extensions are running. 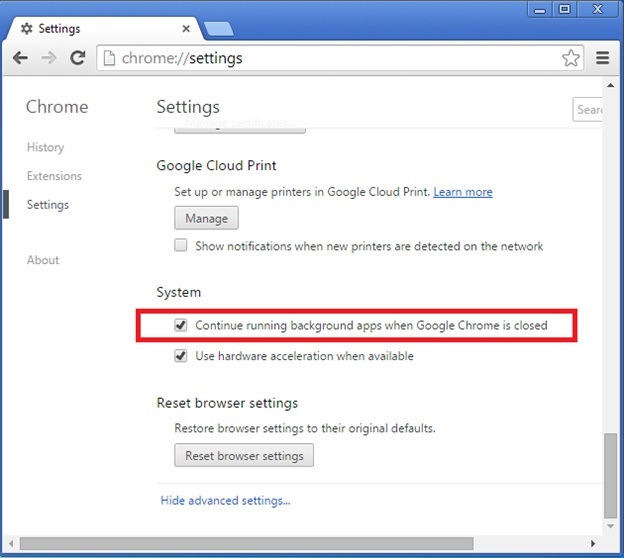 Solution: Follow the procedure in Step 6 to disable offline Chrome apps, and then Reboot. Issue: Identity Safe ("Vault") toolbar button doesn't respond to being pressed in Chrome. In Internet Explorer, clicking the button shows "System Restart Needed"
Possible Cause #1: Norton application is not running. Issue: Identity Safe does not autofill logins on all web forms on Google Chrome. In Google Chrome, when the customer goes to a website, Norton Identity Safe infobar appears at top indicating Identify safe is auto-filling the site, but nothing would happen. Possible Cause: A computer BIOS security setting may not be enabled. If the BIOS security setting for “execute disable bit” – usually referred to as “NX” or “XD” bit – is not enabled, Chrome may by-design not launch a communications process called the Nacl broker service processes. If this service is not running, it will cause the Norton Identity Safe browser extension to unreliably communicate with the Norton Security software and impact login filling or other Identity Safe features. Solution: The computer BIOS security setting for “execute disable bit” – also known as the “NX” or “XD” bit - must be enabled. The below steps are mentioned in previous solutions. Please use the appropriate step for your particular issue. If the Norton product and/or toolbar have been recently updated, it may be necessary to reboot to complete the extension installation, even if LiveUpdate doesn't indicate a need to reboot. Please reboot before proceeding with other steps in this document, since that may be all that is required to finalize the toolbar extension installation. After rebooting, launch Chrome and check for the presence of the Norton Toolbar. If it’s unavailable or not functional, proceed to step 2. If you don't have latest version of extensions, check the “Developer mode” check box and click the “Update extensions now” button. After clicking the button, if you receive any prompt from Chrome to enable a new extension, please do so. Please reboot your computer after this step. After rebooting, launch Chrome and check for the presence of the Norton toolbar. If it’s unavailable or not functional, proceed to step 3. Reboot your computer, then, launch Chrome and check for the presence of the Norton toolbar. If it’s still unavailable or not functional, proceed to step 4. In Chrome, open chrome://extensions to view the installed extensions. 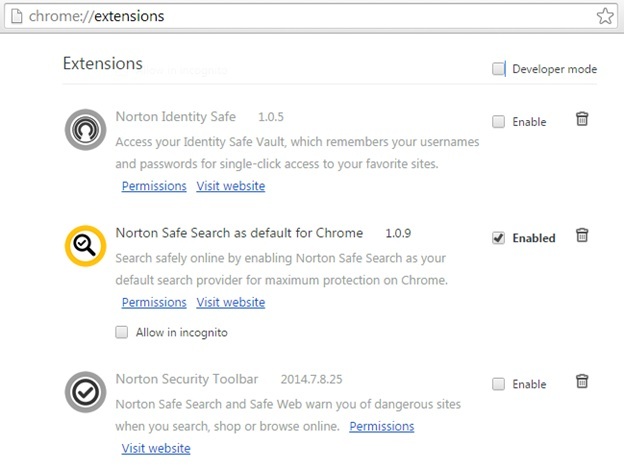 If the Norton Security Toolbar or Norton Identity Safe extensions are disabled, click the checkbox to enable them. If you are still having problems after Step 4, proceed to Step 5. If the Chrome extension is installed and enabled but still isn't working, or if it’s still not installed after the preceding steps, try the following procedure. If Norton Security Toolbar, Norton Identity Safe or Norton Safe Search extensions are present, click the trash can icon to remove each one. If you are still having problems after Step 5, proceed to Step 6.